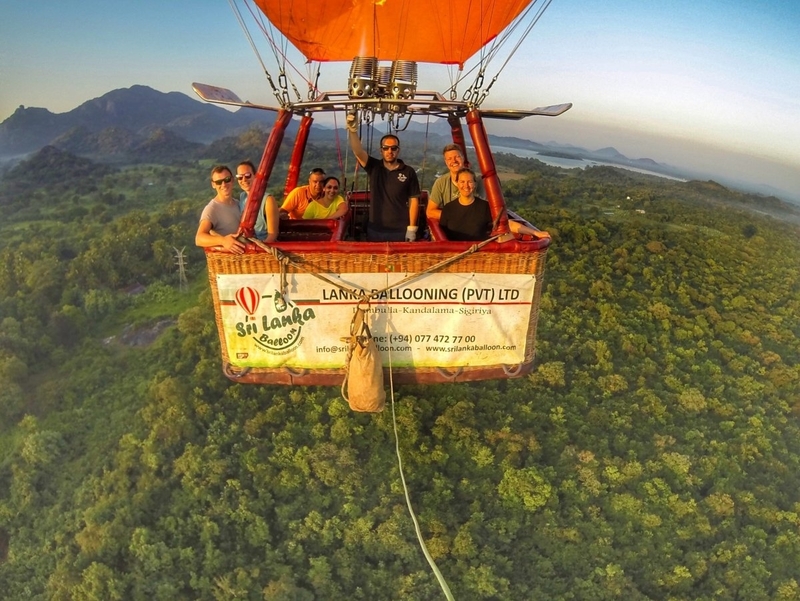 The climate in Dambulla – Kandalama is exceptional for flying balloons, due to its extremely calm and predictable nature. 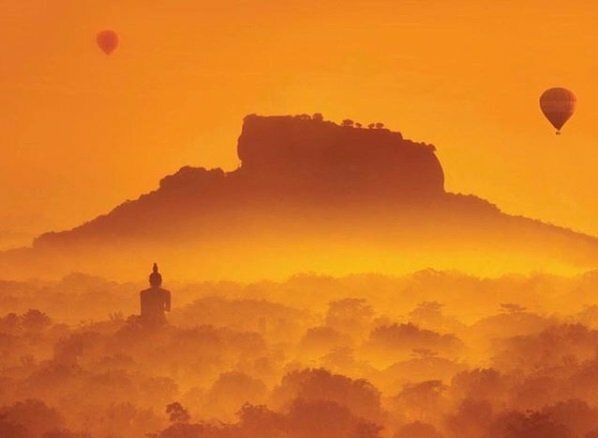 Sri Lanka Balloon Rides generally take place in the early morning (because the weather is more stable), and the average distance we cover, in accordance with the wind speed and direction, is anywhere from one to ten miles. The height at which we fly will vary from tree top level – where we enjoy contour flying at low level to several thousand feet up: the perfect vantage point to observe the majesty of Dambulla – Kandalama area. We spare no expense in the purchase our balloons to operate Sri Lanka Balloon Rides. We work with two of the world’s most prestigious balloon manufacturers: Lindstrand Balloons (UK) and Ultramagic Balloons (Spain). Our baskets are designed for VIP use and all of our balloons incorporate the latest EASA (European Aviation Safety Agency) design and safety features. Our pilots and ground staff are fully qualified and highly experienced. All have many years of experience behind them, some with a career spanning 12+ years. We are proud to maintain the best safety record in 3 years of flying over Sri Lanka. And we are the only one in Sri Lanka with safety belts in the baskets. We fly the newest, spacious, and well-maintained balloons in the island. We carry the fewest passengers per balloon, ensuring a comfortable Sri Lanka Balloon flight experience. Majority of our flights follow a more scenic flight plan and our flight time is longer than any other operators in the area. We do not fly just straight. We descent and fly tree-top level over lakes, trees and all beauties on the ground as well as we fly high. Before your flight, you have an open buffet Sri Lankan breakfast at our take-off launch while you watch how we inflate the balloons. As the leading operator we are the first and only to offer this service. Our ground transportation vehicles are in current and full compliance with the Department of Motor Traffic. All are pretty new and includes A/C which are driven by friendly staff. Our balloons are also in full compliance with Sri Lanka Civil Aviation requirements for safe operation. A personalized flight certificate is presented to each passenger after landing. We’ve been the first to launch this tradition in Sri Lanka. Honest and professional service. 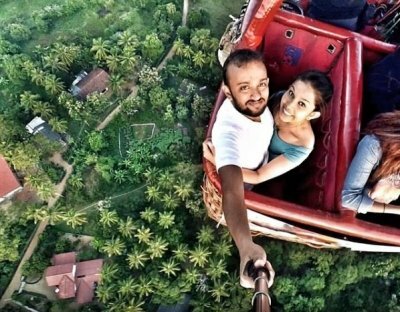 Unique Hot Air Balloon Rides in Sri Lanka. No false statements; hidden costs; extra fees, taxes or charges. 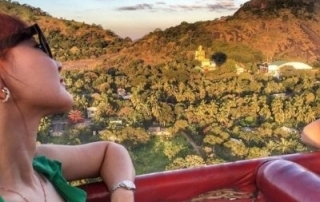 Sri Lanka Balloon Ride prices includes all taxes and fees. 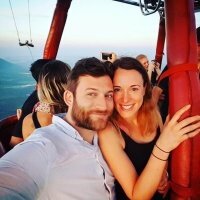 My wife and I had never been hot air ballooning so we weren’t sure what to expect. We were blown away, not just by the incredible view and fun of flying 500 miles in the sky, but by the team flying us! Mahmut and his crew were accommodating and made sure we were comfortable and enjoying our time right from pickup to the celebrations at the end! Totally worth it!!! 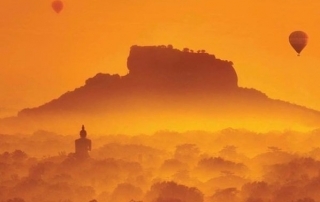 “Lanka Ballooning gave me my best Sri Lanka experience! Taking off at dawn, travelling smooth in complete silence with marvellous views over this beautiful landscape was simply magic to me! My only bitter moment in this unique experience was the moment when the balloon, perfectly piloted by Hakki Yildiz, touched solid ground again. “Expérience de folie. Je conseille vraiment ce site. L’équipe est formidable et super sympa. Le départ se fait très tôt le matin, ce qui nous permet d’apprécier une vue magnifique du levé du soleil et une vue impressionnante sur tout Dambula. Les paysages sont vraiment très beau. L’équipe prend en charge le transfert, ils viennent vous chercher à votre hôtel et vous déposent une fois l’activité fini. Un certificat est délivré à la fin, ainsi qu’une coupe de champagne offerte. Vous pouvez également prendre les vidéos et photos qui sont prise en vol. Un rêve devenu réalité pour un prix vraiment abordable. Highlight of our Sri Lanka trip! “This was by far our best highlight in Sri Lanka! Our pilot was very professional and did an absolute awesome job at giving us the best possible experience! You get to see how beautiful Sri Lanka really is, it’s just jaw dropping. The sunrise was stunning and to top things off, there was even champagne at the end! I would highly recommend this activity with Lanka Ballooning Pvt Ltd during your stay in Sri Lanka. You wont regret it. Thank you once again for this amazing experience! Vanmorgen een prachtige ballonvaart gemaakt met piloot Av. Mahmut Sami Uluer. Zeer veilig, prachtig uitzicht en we hadden mooi weer om erg ver te kunnen kijken. Uitzicht was echt heel mooi. Wij zouden het iedereen aanraden, prijs is het zeker waard. You only life once! “Booked this for our wedding anniversary. I sent e-mail the company just a few days before flight. They were very prompt with their replies. We were collected from the hotel at 5:30am. (NB – the driver may be waiting in the car park as opposed to the hotel lobby-) just in case you’re looking in the lobby. We had opportunity to watch the balloon being inflated. I thought I’d be scared of the height but the process was so smooth and felt so secure that this wasn’t an issue. The views were amazing. 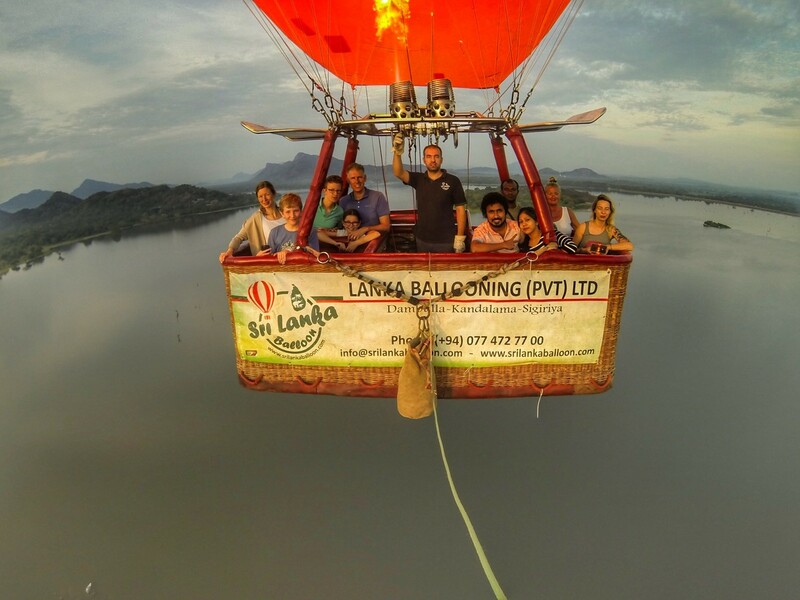 You can turn your special occasion, such as a birthday, anniversary, marriage proposal or ceremony, into a truly unforgettable experience with a Balloon Flight over the beautiful landscape of Sri Lanka. Get a diamond ring for your true love and pop the question 500 feets in the air. Give her the proposal, she will never forget. Just let us know about your plans a few days before your Sri Lanka Balloon Flight and we will prepare a banner with a few words of your liking. And our crew will open it on the ground right after your take-off and surprise her. And let’s celebrate the event with champagne floating over the magnificent Sri Lankan skies. Celebrate your wedding anniversary hundreds of feets in the air. We will decorate the basket with a banner and flowers from majestic Sri Lanka. All you have to do is smile to our in-flight camera for unforgettable pictures. 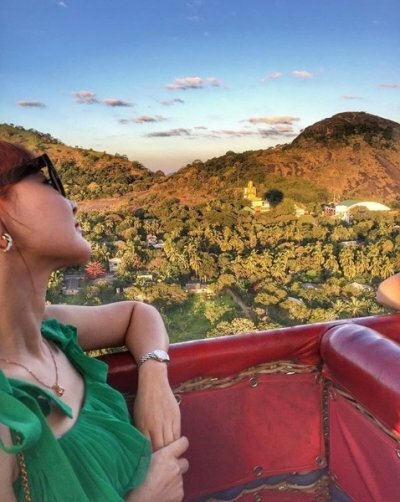 Hot Air Balloon Rides in Sri Lanka are good opportunities for special occasions. All kinds of private flights, for couples and families. You and your beloved ones alone. Well and Sri Lanka Balloon’s pilot of course. When it comes to the perfect flying gift experience, a Hot-Air Balloon Ride is the ideal present for that special someone in your life. 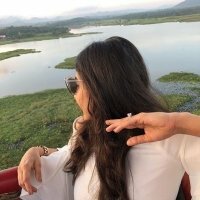 Whether you’re looking for birthday gifts, anniversary gifts, Christmas gift ideas, or wedding gift ideas, make their day even more special with Sri Lanka Balloon Ride. Sri Lanka Balloon Gift Vouchers purchased by simply completing the Reservation Form. Please mention that you want to book the flight as gift in the Requests section of the form. Once your booking is confirmed, we will e-mail you the flight voucher. 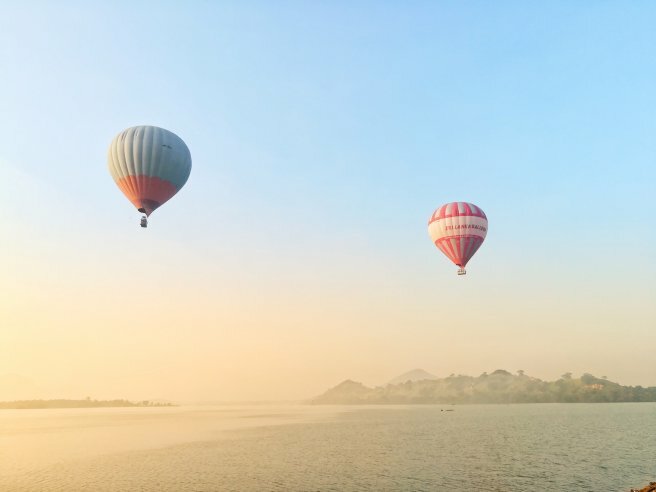 The gift certificates will be valid for any day for one year from the date of issue (Hot Air Balloon Rides in Sri Lanka operated from November to May). “Excellent” by travellers on TripAdvisor. Our service, staff and qualifications tested by the authorities as well as by the travellers. 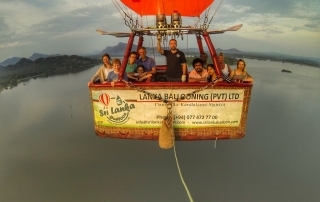 Sri Lanka Balloon – Lanka Ballooning (Pvt) Ltd is a fully licensed operator and approved by the CAASL (Civil Aviation Authority of Sri Lanka) affiliated to Ministry of Transport and Civil Aviation and relevant ministries to operate Hot Air Balloon Rides in Sri Lanka. All our pilots hold Commercial Balloon Pilot License and Validation Certificates issued by the Civil Aviation Authority of Sri Lanka to operate Sri Lanka Balloon Flights. All our balloons have Sri Lankan Civil Aircraft Registration Certificates and Airworthiness Certificates issued by CAASL. Sri Lanka Balloon is fully insured by Sri Lanka Insurance Corporation. Insurance policies are approved by Civil Aviation Authority. 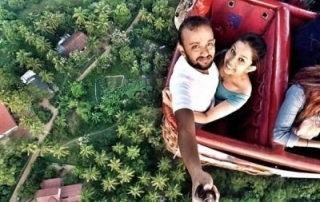 Would you like to see Sri Lanka Balloon’s Insurance Policy? Please click here. Sri Lanka Balloon Pilots and ground staff are fully qualified and higly experienced. All have many years of experience. Our Turkish pilots hold Commercial Balloon Pilots License and validated by CAASL according to their experience and tested every year by the examiners of the Sri Lankan authorities to operate Hot Air Balloon Rides in Sri Lanka. 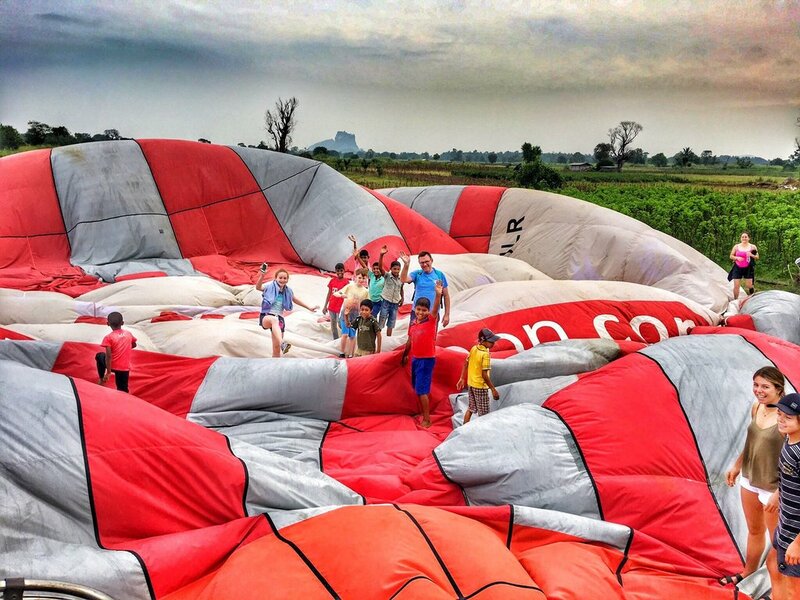 They have thousands of flight hours as professional commercial Hot Air Balloon Pilots. And thanks to our dedicated local colleagues on the ground who do all the hard work, Hot Air Balloon Rides in Sri Lanka are unforgettable, as they are safe and high quality.